With inspiration from some impressive musicians, a Calgary singer/songwriter with Okotoks roots is ecstatic with her latest album. 7 out of 10 stars- "A fine set of unsettling folk reveries." A little bit of torch, a dash a tin pan alley and a polychromatic splash of Nick Cave-style backroads goth, and perhaps we're starting to get close to what Danielle French is trying to do here. She processes her vocals into that slightly scratchy, slightly echoey territory that was well-worn by a wide swath of 50s vamps. Then she drops in her lushly-arranged songs, and the result is a sumptuous bed of pleasure. The sound is familiar and enthrallingly unique all at once. French mixes her influences into a perky, doomy and thoroughly modern mixmash of Marty Robbins and Julie London. I've heard all of this before, but never presented with such presence and panache. These are indeed dark love songs, but they are alluring and not depressing. This is not breakup music, but rather an album to play while getting out the leather and chains. Riding crop required, not optional. The kink here is the mainstream production. French doesn't make her music sound weird. This is as straightforward and muscular a sound as will be heard on an album this year. French simply makes sure that her ideas bring the pleasurable little twists of pain. It's been a long time since I've had such a rush of joy and fun. If you and your sweetie aren't exactly conventional lovers, French has your soundtrack. Just don't wake the kids. Have you ever seen the movie Dusk till Dawn? Quentin Tarantino didn’t know the perfect soundtrack for this movie would come out 2016. 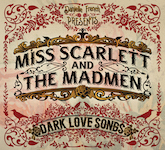 That album being Miss Scarlett and the Madmen: Dark Love Songs by Danielle French. There are too many reasons to point out why I think this music mimics that movie from the imagery to the tone. Luckily, this album does not need a movie to be throughly enjoyed. Some albums win you over quick with their commitment alone. The fact Danielle French persevered with the recording of Dark Love Songs over a four year time frame, returning each time to the same location to continue recording, signals this is an artist absolutely convinced she has something to say. Although not yet widely known, Calgary's Danielle French has been creating music now for about two decades. 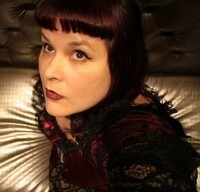 Ms. French's music is moody and slightly peculiar and has been compared to classic artists like Kate Bush and Tom Waits. 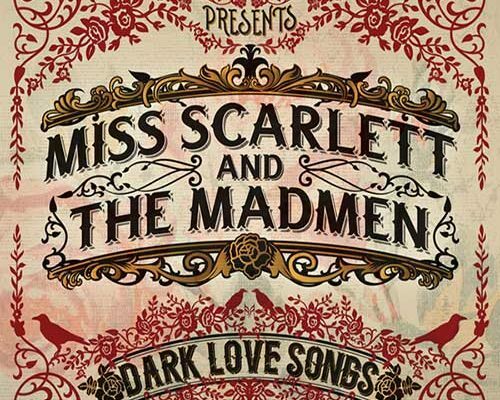 The strangely-titled Miss Scarlett & The Madmen: Dark Love Songs might just be the album to catapult Danielle's career to the next level. Most of these tracks were recorded at two different locations in Wisconsin, but one ("Splinters") was recorded in Calgary and another ("Black Sunday) was recorded at Peter Gabriel's Real World Studio in England. French has a rather amazing voice. She's able to conjure up images and feelings that go far beyond the words she's singing. This is a short album that clocks in at just over twenty-six minutes. Nine impeccably recorded tunes including "Last Goodbye," "Black Sunday," and "This Is Why We Drink." and it has changed drastically over this time period. You used to have to rely on a record label to sign you to get your music out as an artist. These days an artist can feasibly record and release their own music without a label. But this has also meant that the artist needs to perform all the business functions to promote their careers themselves- from publicity to web design to tour booking to social media and more. For myself, I am only one person and have found it impossible to do each “business” task at the level it needs to be done to effectively promote my career. And it takes away from the time I want to spend becoming a better artist! Quite the dilemma! 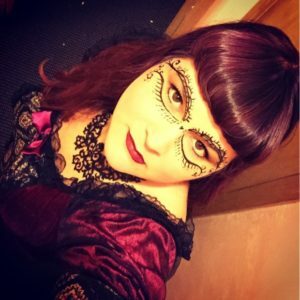 Adult Alternative/ Dark Cabaret / Dark Folk – “Beautiful Strangeness”. Calgary, Canada based singer / songwriter Danielle French debuted with "Me, myself and I" in 1995 and 2 decades later she releases the 5th album "Dark love songs" together with the musical collective Miss Scarlett and The Madmen. Listening to the new album feels like going down in the dungeons of London and hearing the horrific tales of Jack The Ripper and other dark historic events. It´s easy to believe that Danielle is heavily influenced by artists like Kate Bush, Dalbello and Nick Drake. The sound is built on Irish folk music and gothic romantic pop. A lovely mix. Perhaps not the best suitable music for the children´s party but just perfect for halloween, it´s a short album but a beautiful short album.